Point Pleasant football coach Dave Darst talks with his players as they break a huddle during a Class AAA opening round playoff game against Jefferson at OVB Field in Point Pleasant, W.Va.
Just another magical season, much like the previous six. The Point Pleasant football team re-wrote most of the school’s record books during the 2014 campaign, one that included a seventh straight postseason appearance to go along with the program’s sixth unbeaten regular season — and second straight overall. The Big Blacks will enter the 2015 gridiron campaign with the Mountain State’s longest regular season winning streak, which currently sits at 23 in a row. PPHS also improved to 7-12 alltime in a dozen postseason appearances while increasing the program’s winning record at Ohio Valley Bank Track and Field to 34-4 overall — including a 5-2 mark in the playoffs. However, this year’s version of Point Pleasant football was a little bit more refined than most — one that saw incredible numbers put up on both sides of the ball. The Big Blacks, for the season, allowed just 10.1 points per game while churning out close to 44.8 points offensively. Through nine regular season contests, PPHS outscored opponents by a 471-52 overall margin while surrendering an average of 144 yards per game. Conversely, the Big Blacks produced roughly 458 yards of total offense in those nine wins, which also included four shutouts. 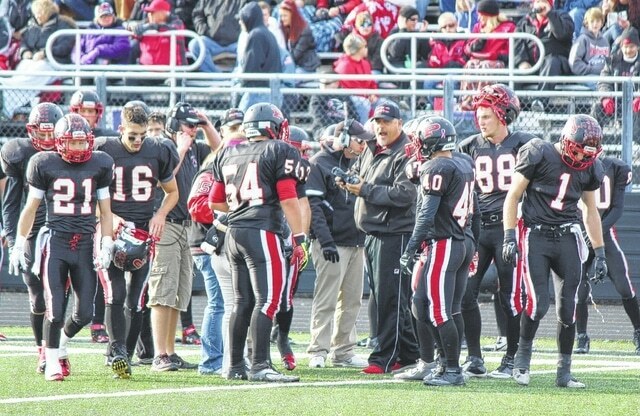 Point Pleasant went the entire season without throwing an interception and also saw records fall in the kicking department, as well as in rushing, points scored and individual touchdowns in a game. PPHS also joined Capital in the regular season as the only unbeaten Class AAA programs in West Virginia. The Big Blacks rolled to a 38-20 victory over Jefferson in the opening round of the postseason, their second straight season with a playoff win and third Class AAA victory overall. PPHS, however, had its magical run end during a 49-28 setback at then four-time defending champion Martinsburg. Point Pleasant lost a lot of players to graduation, which included the likes of Jon Peterson, Dylan Lunsford, Bryan Hart, Aden Yates, Brian Gibbs, Gage Buskirk, Cody Siders, Cody Marcum, Trenton Ramey, Travis Wamsley, Caleb Sayre, Noah Morgan, Chase Moses, Trevor Daniels and Brandon Troy. Those 15 individuals were part of a program the accumulated a 42-6 overall record during their four-year tenure, which included a 17-3 mark in road contests. The Class of 2015 is also only one of four groups to make the playoffs during all four years of their high school careers. Dave Darst — who just completed his eighth season — owns a 63-21 alltime record as head coach at PPHS, as well as a 5-7 mark in playoff contests. The Big Blacks will also have a pair of Division I prospects returning for the 2015 gridiron campaign in offensive lineman Seth Stewart (verbally committed to Marshall) and senior tailback Cody Mitchell (three-star recruit), as well as several other starters coming back. Point Pleasant football serves as the No. 4 story in the 2015 Ohio Valley Publishing Top 5 sports stories of the year.